Duke Street Altona North is another of our streets that has been named to honour not only one of Altona’s pioneering families but a man who gave so much to our community. James Francis Duke was born in 1863 in Newham, Victoria to parents George and Anne Duke. James married Mary Margaret Bell in Fitzroy on 9 February 1888 and they had 12 children, many of whom had reached maturity by the time the family moved to Altona in 1917. When they first settled here they lived in a tent whilst their house was being built in Bayview Street, however it wasn’t long after that the Army acquired their home and purchased them another in Mount Street. You might have thought that with having 12 children and building a house then moving James would have little time for anything else but he was a man for his community and he gave a great deal at a time Altona was still an emerging district. When James Duke first came to the district there were no churches, so he helped build one. Money was scarce so the Catholic Church was built from the funds he raised by organising functions. He was also a Commissioner for Affidavits and played an active part in the Progress Association. He was a founding member of the Altona Life Saving Club, Altona Football Club, and Altona Cricket Club to name some of his achievements. James’ son George was the first soldier from Altona to return home after WWI and his battalion colours were purple and gold. These became the colours adopted by the Altona Football Club and remain so to this day. James was part of the first committee organising the establishment of a new hospital in the local area, bringing the project to fruition when the doors in Pier Street opened in October 1932. He was described as a tall, stout and energetic man, quietly spoken and a true gentleman. There is a story that he let a man, his wife and large family stay in a house he owned rent free, and he lent money to members of the football club to buy their jumpers. James Francis Duke died on 2 August 1941 in Altona, when he was 78 years old, and his wife Mary died in 5 July 1944 in Brunswick, at the age of 77. Edward Blackshaw held 350 acres of land at the west end of the road that now bears his name, around the late 1850’s to 1890, where the family kept pigs and other animals for slaughter. Blackshaws Road runs eastward from what was the Brooklyn bridge to Williamstown. Edward Rowse Blackshaw was born in 1850 in Northamptonshire, to parents Edward and Sarah Blackshaw. The family arrived in Victoria around 1853 where they moved initially to the Sydham district before moving to the Altona/Brookly district and purchased farm land. Edward Jnr married Clara Griffiths (1849 – 1927) on 23 October 1871 in Wesleyan Church, Punt Road Prahran and over the next 25 years they had 14 children, 7 sons and 7 daughters. Edward Snr passed away in 1864 (aged 44) and it appears that Edward Jnr and his brother John took over the running of the farm and business until they sold or leased part of the property t Charles Newport, who operated a licensed slaughterhouse. In March of 1872 Edward appealed to the Werribee Shire council to improve the road as the Blackshaw’s found it difficult to navigate their wagon along the road to market. He was advised that they would provided that he put broader ‘tires’ on the front wheels of the wagon to spread the load more evenly and reduce damage to the road surface. He complied by placing 6 inch wide metal bands as wheel tires. 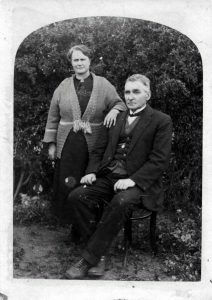 It appears that Edward and Clare sold and moved to Yarragon, in Gippsland around 1890 and settled into rural life there and join into the local community. Edward took up a role as a member of the Board of Guardians of the local Church of England (St Marks). Edward passed away on 11 October 1920 in Yarragon, at the age of 70. The local newspaper noted ‘one of Yarragon’s oldest residents, in the person of Mr E Blackshaw has passed on. He was very well known, and was a most sterling character. Though he never took a prominent part in public matters, he was very staunch in support of clean, straightforward dealing in all matters, whether public or private.’ Clare passed away on 14 February 1927 in Warragul, at the age of 77. Millers Road, that stretches from Brooklyn, in the north, to Seaholme, in the south, was named after one of our early pioneers Thomas Miller. Thomas arrived from Durham, England to find his fortune in the Victorian Goldfields, but later became a carrier and transported goods and suppliers to the miners. In about 1867 he purchased a farm at what I the northern end of Millers Road at the junction with Geelong Road, and grew hay for the Melbourne market. In 1876, Wyndam Council began the construction of the main road that fell within its jurisdiction. Thomas Miller built and operated the ‘Half Moon Inn’ at the junction which was used by many migrants who had arrived via the Williamstown ports and were heading for the goldfields. 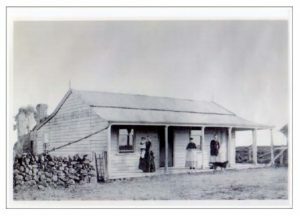 The picture below shows the original building with Mrs Miller, holding the young child, standing under the verandah. The verandah was later removed when the building was converted and operated as a post office for about 42 years. Family member, Stan Miller, constructed a brick house on the site for his family, but the house later made way for a Milk Bar and a Caravan park which remained until the land was sold in 2010 and the caravan park ceased operation. 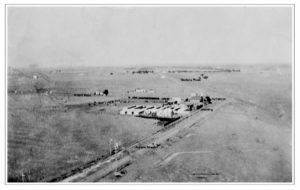 The photograpgh below shows the Miller farm at the intersections of Francis Street (in the foreground), Geelong Road (heading north-west from the buildings) and Millers Road (heading left from the buildings).